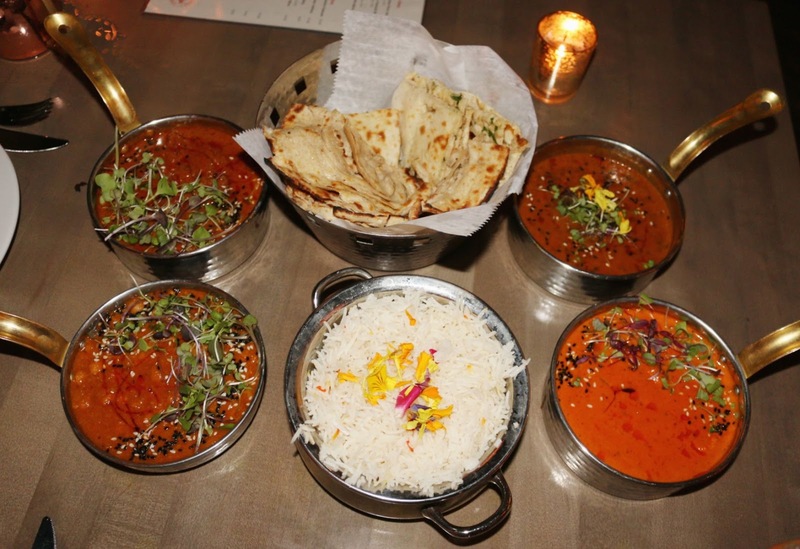 In the realm of Modern Indian cuisine, Center City could definitely do better. We lost a gem with Tashan. And though we've made delicious strides with IndeBlue, for a cuisine with such intricate layers of flavors and spices, there could be more options, especially in the finer dining scene. Enter Veda, a gorgeous Rittenhouse venue. Veteran Chef Vipul Bhasin boasts more than 25 years of experience and also runs Coriander and Indiya in Collingswood, NJ. 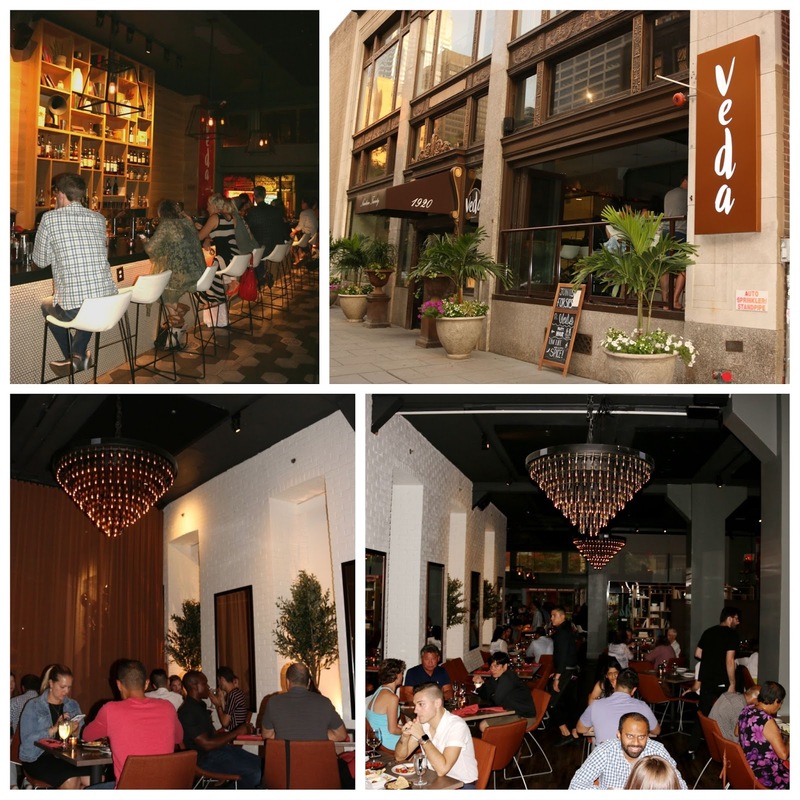 And in partnership with owner Inder Singh, a former engineer-turned-restaurateur, they have a great space in Veda. The glass doors slide open to beckon you toward either the sleek bar or the spacious dining room, which features a large table in the back. Seeking a private dinner? The ceiling-height curtains can easily be drawn to make dinner a private affair. I started off with their gin and tonic, featuring Portobello Road gin. Without being too heavy on the juniper, this was light, floral, with a bit of peppery kick that went nicely with the grapefruit zest and twist. 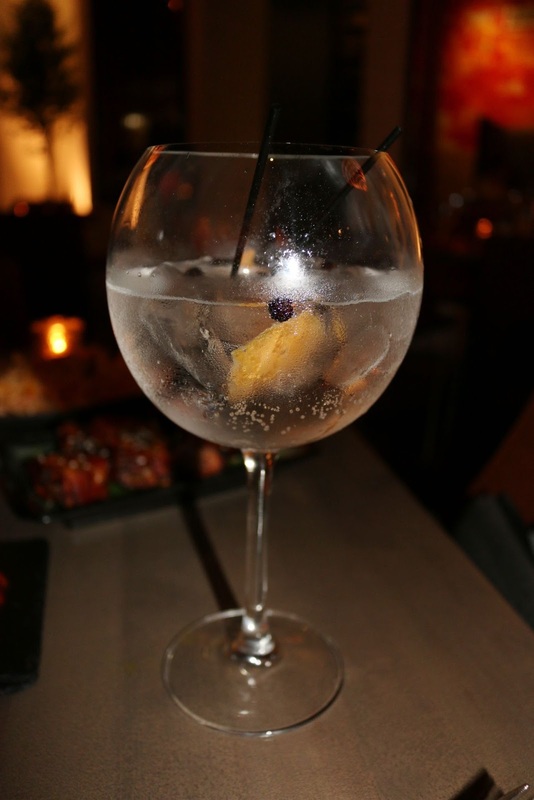 Gorgeously presented in the large wine goblet, with juniper berries floating around, this was perfect for the summer. The GF really enjoyed the Karishma, which was essentially a tequila mule, with the chili-infusion working to great effect in coordination with the spice of the ginger beer. 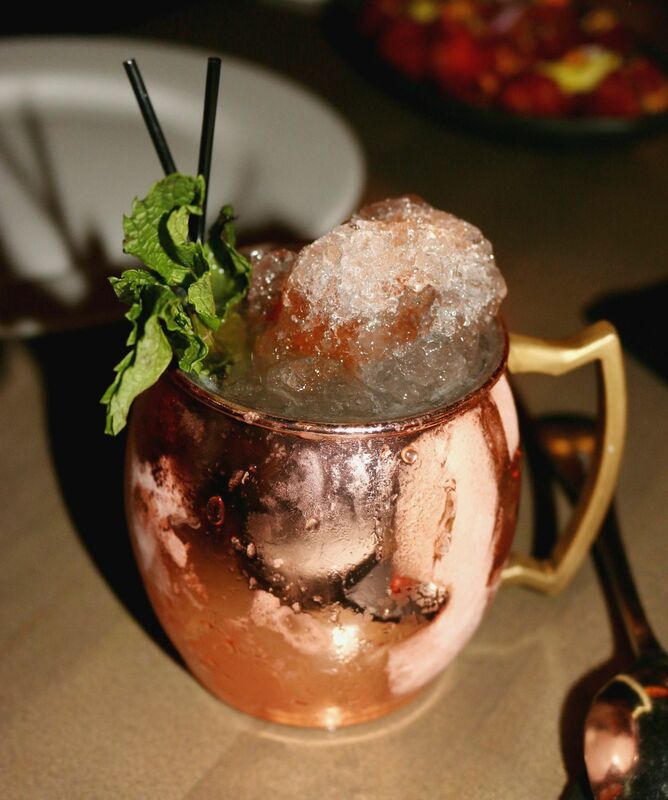 The fresh lime and agave helped to temper the drink with a bit of citrusy sweetness. 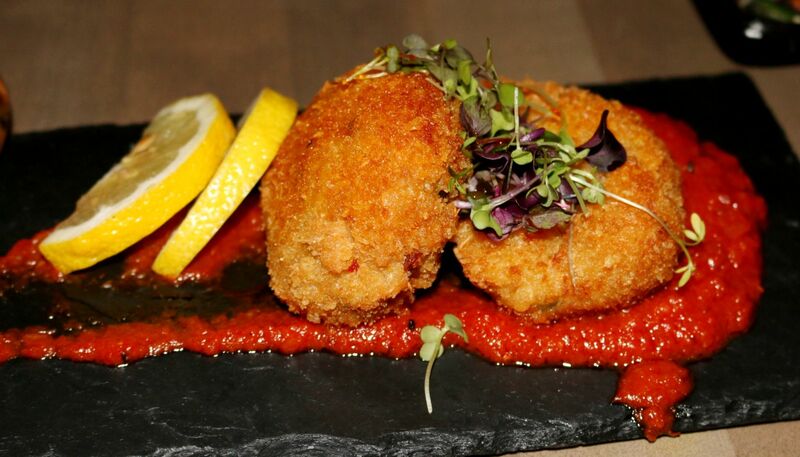 Deftly fried, the masala crab cakes had a nice mix of sweet crab, coconut, and fennel. The panch-poran tomato chutney was a mix of sweet and cumin that should be easily palatable for those unfamiliar with Indian spices. 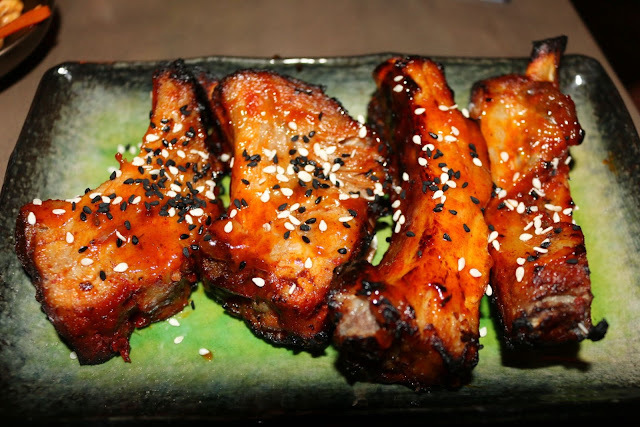 Calcutta pork ribs are a must order in my mind. The sweet and sticky mango chutney glaze wasn't overpowering and there was plenty of tender pork falling off the ribs. White and black sesame helped to add texture to each bite. Get an order of these stat! The chicken tikka offered two versions of breast meat marinated in green chili-mint-cilantro or a tangier marinade of yogurt-mustard-fennel. Moist and with a light char, they came with a tamarind chutney and a green-chili sauce. 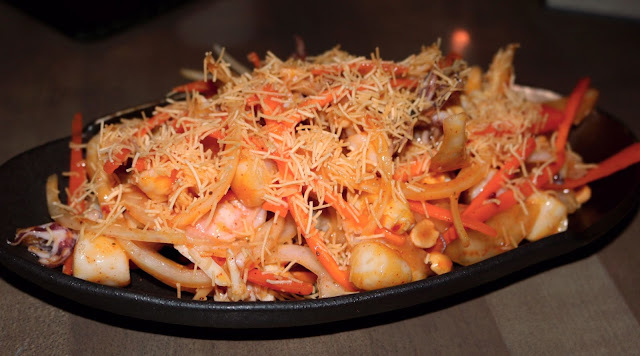 A healthy-portioned melange of seafood offered up snappy shrimp, baby scallops, and calamari, with a light and tangy green mango and peanut sauce. Roasted peanuts and the bite of grilled onions helped to offer texture to each bite, along with the crunchy bits of sev noodles. 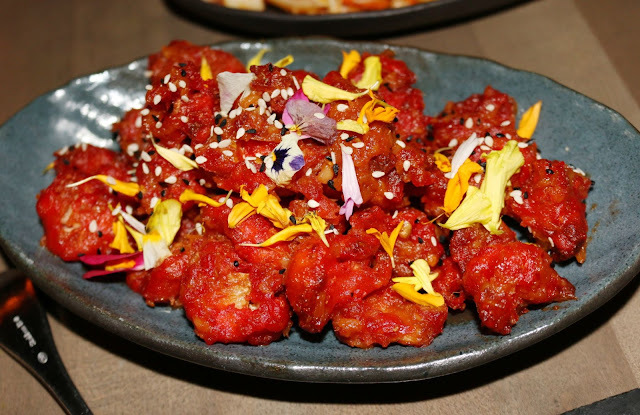 Quite possibly one of my favorite bites of the year and easily my favorite bar snack is the Lassoni Gobi. Forget about buffalo cauliflower, these are the way to go! Beautifully adorned with flowers, these tangy cauliflower are fried without any greasy overtones. Sweet, salty, sour, garlicky, and savory notes are all there. Easy to down a plate of these with a proper drink. For our mains, we were brought out basmati rice and plenty of naan to sop up the kaleidoscope of masala, tikkas, and dals. Let's talk proteins first. There were huge chunks of moist chicken throughout the tikka makhani, with tender, grassy lamb in the vindaloo. The dal and channa masala were hearty and flavorful. In terms of spice level - don't fear! If anything, they veer on sweet, with acidity coming from tomatoes in the case of the chicken tikka and cinnamon in the vindaloo. The spiciest of the quartert was the channa masala. But even then, the heartiness of the chickpeas along with the pomegranate and green mango helped to temper the back-burn. And don't forget - there's plenty of naan on offer at Veda. Crisply textured on the exterior, the barely-risen dough offers great chew and savoriness. Our favorites were the garlic as well as the onion-sage. There's also a goat-cheese iteration that's got to be killer as well - so get to sopping! Asian cuisine isn't typically known for sweet desserts, but Veda has a variety on offer, often paired with house-made ice creams. 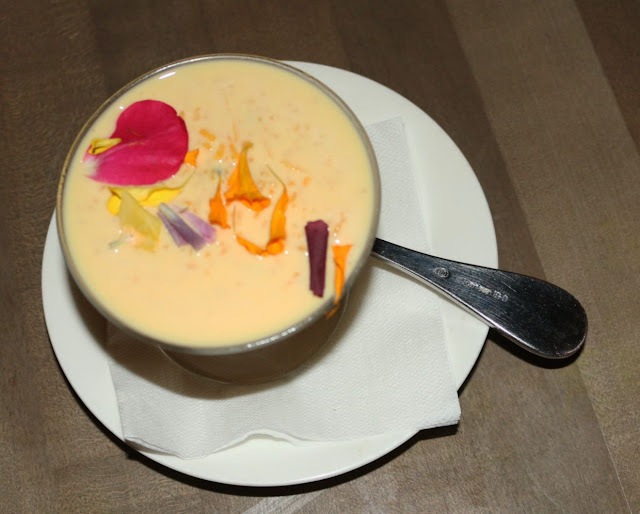 We opted for the Saffron Kheer, which was a subtly sweet rice pudding, flavored with aromatic hints of saffron and cardamom and plenty of texture from the macerated basmati. So if you're intrigued or have never even had Indian flavors, definitely stop by Veda. They'll provide you with a great culinary introduction to Indian flavors, with a modern twist. 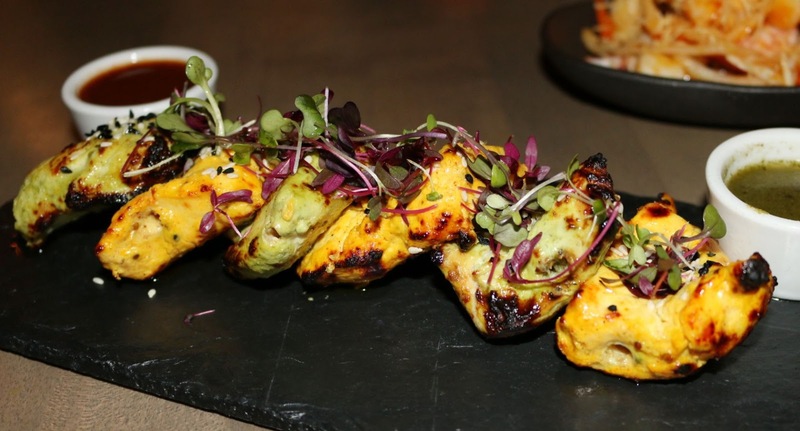 And if you're seeking Indian flavors with a modern twist, you're also in luck. Those seeking spice, don't hesitate to ask them to bump up the heat! FTC Disclaimer: Thanks to Veda & Gloss PR for hosting us. Regardless, my opinions are mine alone and, therefore, unbiased.